Video Recipe - When it comes to sauerkraut the opinions are divided. Some love it and others hate it. I hardly ned to say where I belong, as I am currently writing a recipe for it. The saukraut that you can buy are typically made by putting cabbage into vinegar. This is certainly not the best way to do it. It should be made like yogurts and sourdoughs, by fermenting until it becomes really good and healthy. Remove any brown spots or vilted leaves. Remove the stem. Cut the cabbage as finely as possible. Place in a large bowl and pour on the salt. Crush the cabbage until it becomes soft and wet. Put it in an airtight glass or earthenware jar. However, it must be able to let out air, as gasses will be forming in the cabbage during fermentation. No need to to have your sauerkraut exploding in the cellar. Also it is uncomfortable to step in. Pack the cabbage as close as possible. 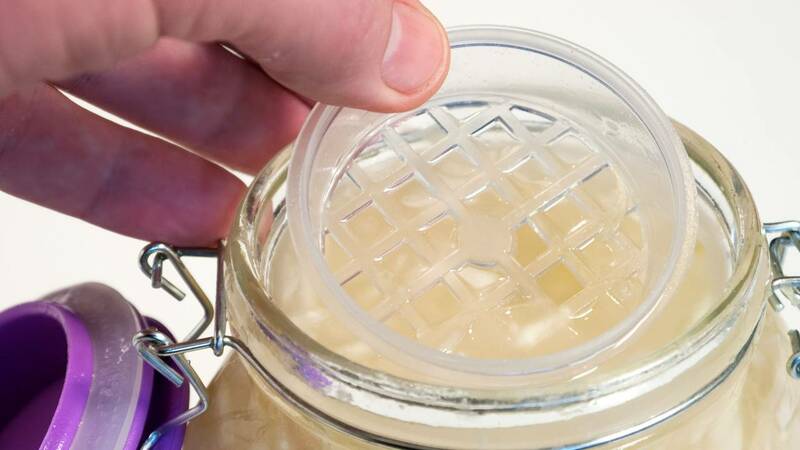 Any air bubbles increases the risk of rot instead of a nice fermentation. Ideally the juice from the cabbage should cover the cabbage itself when it is firmly pressed. You can cover the cabbage with a small amount of water. Not too much though, as it alters the salt balance . Close the lid and leave it to ferment at room temperature for 2-3 days . Depending on the rooms temperature. Typically 3 days though. Then it is ready to be eaten or stored. The warmer and the longer you store it, the more acidic it becomes, and the shorter the cabbage remains crisp and white. Storage is important for both the taste and the texture. 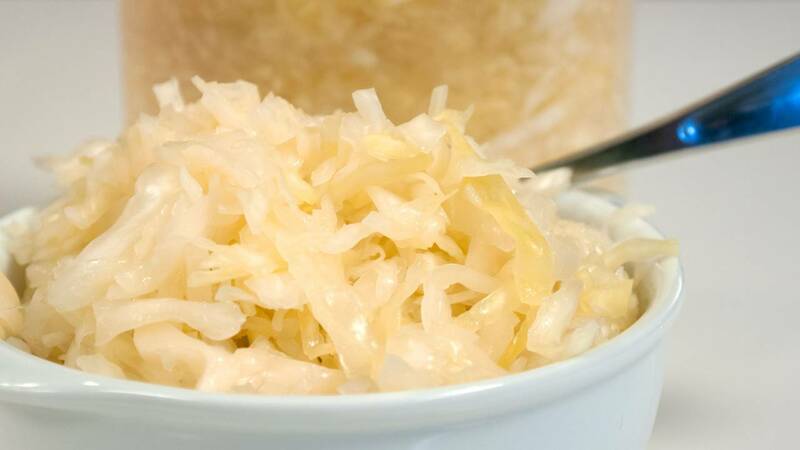 I like sauerkraut that has been stored as short as possible so that it is tart and crisp without being very sour. So a cool cellar or refrigerator is preferable. it can also be stored at room temperature, but then it quickly becomes sour and soggy. Generally you use 2% salt relative to the weight of the cabbage. Clean the cabbage by removing brown spots and the stem. Then weigh what remains. Divide that weight by 50 to get 2%. In the video I weigh my cabbage, and it weighs 903 g (32 oz) So : 903/50 = 18.06 g salt. About 0.6 oz. There is typically 1-1 ½ tbsp of salt per kg (1 lbs) of cabbage. The amount of salt is important as that is what makes the right cultures win the fermentation match. So if you do not add the salt, you risk rot instead of acidification. Don't worry, you will know out if this has happened, from the smell and appearance . It is best to use glass or ceramic container to ferment in. It must be a container that can withstand acid. The mason jar with a rubber gasket and glass lid is convenient, because excess gas automatically is vented. A canning jar covered with plastic wrap, which is held in place with a rubber band, is quite good enough though. The crushed and compressed cabbage takes up roughly 1 liter/quart per 1 kg/2 lbs. So usa a 2 liter/quart glass for a large head of cabbage and a 1 liter/quart glass for a small cabbage. It is important to keep the cabbage submerged in the brine. It minimises the risk of mold and rot. Fermentation is a natural preservative , so the sauerkraut does not go bad in the sense that it makes you sick. The taste just deteriorates with time. It is the best during the first 3 months if kept cool. As long as it smells and tastes fine and is sour, it is also fine to eat . The acid kills everything else. 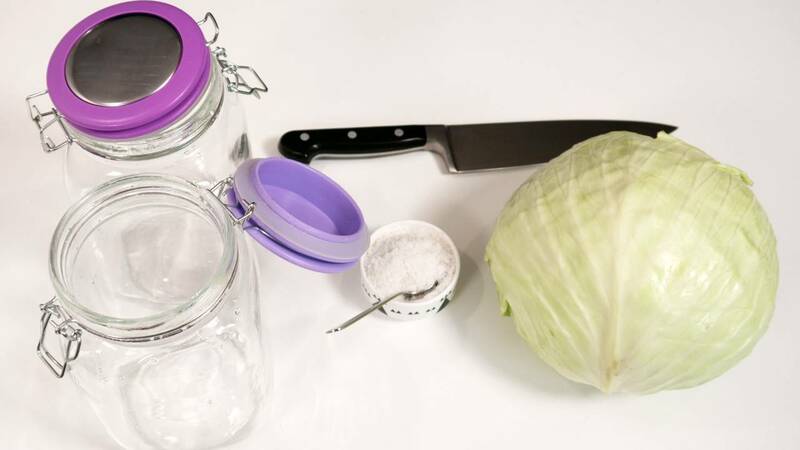 If there is too little liquid in the jar, the top layer cabbage can get a little discolored. Which usually does not matter. Just remove it and then eat the rest. A nice smell and a good flavor is the yardstick . There are different opinions about what to do if there is some moldy spots on the surface of the cabbage . Someone throw out the entire glass. Others just remove the mold and the top few centimeters. Although I am in the latter group . My theory is that the mold does not spread into the acidic environment beneath. If I do have a sauerkraut with moldy specks, I don't serve it for guests though. according to the USDA; it is important to use 'kosher' or pickling' salt - or any other as long as it NOT IODIZED ! Apparently the little bugs that do the fermenting do not get along with iodine which is routinely added to table salt in North America. Danish salt is iodized too, but I have never had any problems using it. I used iodized and it worked fine for me, too, in the US. Been lacto-fermenting veggies for years now.